Japonais....it's like eating a Kinder Bueno cake, but more decadent! I came across the recipe for Japonais in "Ultimate Cake" by Barbara Maher. A Japonais is a classic french pastry with traditional almonds and mocha filling. 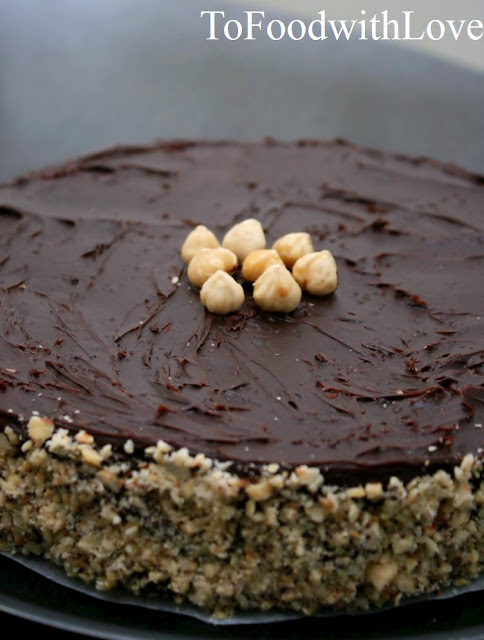 This version uses hazelnuts and chocolate ganache. I had never had it before this, but it looked easy to make and one of the ingredients was potato flour. I was curious about this flour as I had never used it before.﻿ Apparently, it is made from boiled, sieved and dried potatoes and produces a delicate, airy texture. So after chancing upon the flour at the supermarket one day, I bought it and decided to try out this recipe. Recipe adapted from "Ultimate Cake". 1. Mark two 24cm circles on baking sheets. Mix half the caster sugar with the hazelnuts, icing sugar and potato flour. 2. Whisk the egg whites into soft peaks. Gradually whisk in remaining caster sugar until they form a stiff, glossy meringue. Fold in nut and sugar mixture until evenly mixed. 3. Spread mixture equally within the marked circles to form two flat discs and bake in preheated oven (160°C) for 1 hour, or until meringues are dry and crisp. If using both top and bottom oven racks, switch racks after 40 minutes and extend baking time by 15-20 minutes. Leave in oven with door slightly ajar to cool for 1-2 hours. Carefully lift off the lining paper after they have cooled. 4. Spread half the ganache over the base of one meringue disc. Cover with second disc, smooth-side up. Spread remaining ganache over the top and sides of cake. 5. Press most of the chopped nuts onto the sides, and arrange the whole nuts around the top. Sprinkle the centre with remaining nuts. 1. Pour cream into a small pan and slowly bring to boil over a gentle heat. Take it off the heat and gradually stir in chocolate pieces until well incorporated. 2. Leave to cool in refrigerator until firm but not set. If you love Nutella and you love Kinder Bueno, you will love this. The meringue is light and crisp, acting as a vessel for the hazelnuts, and blends nicely with the rich chocolate ganache. 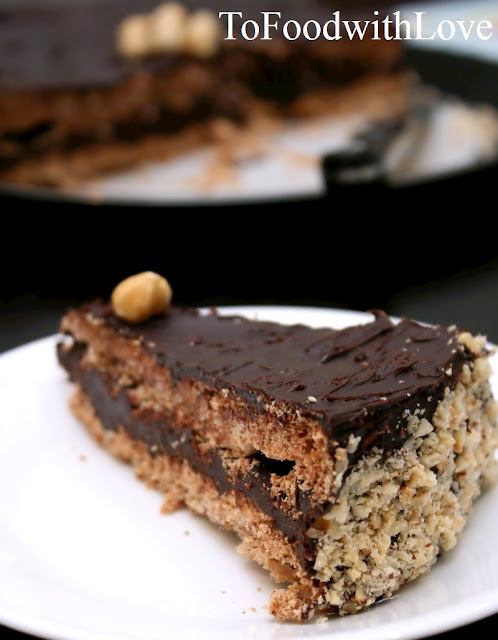 It is a rich and decadent dessert, and best eaten within 2-4 hours after it's made. Keeps in the fridge for 4-5 days. this looks so good...i cannot believe you made it at home!! you need to move here!